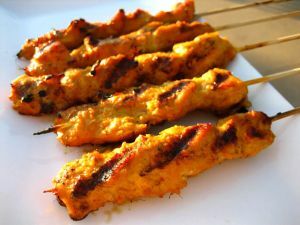 Satay is a Cambodian food recipe for meat skewers. In a large mixing bowl, combine the first 4 ingredients and mix well. Cover pork with fish sauce marinade and refrigerate for 4 hours or overnight. In a deep saucepan, mix remaining ingredients. Bring to a boil over high heat, stirring constantly until well mixed. Place this coconut-peanut butter sauce in a bowl, cover, and refrigerate. Soak 8- or 10-inch bamboo skewers in water for half an hour so they won’t catch fire in the broiler. Thread pork onto skewers accordion style. When oven is preheated, broil pork for 8 to 10 minutes, or until done, turning often so all sides are cooked evenly. Serve hot with bowls of the coconut-peanut butter sauce for dipping.